These are some of my favorite George Jones song lyrics, I know he has hundreds more available but it'll take a long time to do all of them. What can you say about this guy that hasn’t already been said during his fifty plus years of singing country music. I don’t know how many songs he’s recorded, but it includes a lot of great ones. 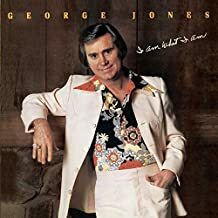 I’m sure you have your favorites by this true legend, browse George Jones song lyrics to see if we have some of them. Maybe you’ll find these lyrics with chords that might help you as you strum your guitar and sing these country classics. George had his first chart hit in 1955 “Why Baby Why” a song he co-wrote and in 1956 “Just One More” reached number 3 on the chart. He later moved to Mercury Records and had his first number one hit “ White Lightning” in 1959. He hit number one in 1961 with “Tender Years” and She Thinks I Still Care”. In 1967 George recorded one of his biggest hits “Walk Through This World With Me”. When we play a George Jones cd, we know it’s gonna be country, he’s never abandoned his love for pure country music and country gospel songs. And for that, those of us that enjoy real country music, we can be thankful.